Lots of sunshine, blue skies and outdoor fun…Ah! The summer season! You and your dog may love the summer season but here’s what you need to remember. It can bring some bad news especially to your dogs. The sizzling days of summer can kill your dog in just minutes. Even the healthiest, most athletic dog can get heatstroke and other heat related illnesses. So you better be super mindful. Any dog with compromised health is even at greater risk. Heat wave is all too common these days in many parts of the world during the summer season. To keep your dog safe, here are simple and common sense strategies. Let her stay indoors. Keep your dog inside during the hottest part of the day. Minimize vigorous exercises. Cut down on vigorous exercises your dog usually enjoys. This is kind of heartbreaking and you probably might get some protest from your pooch but this is for her own good. Never leave your dog in the car. Never, under any circumstance whatsoever leave your dog in your parked car even if it’s just for a minute. Temperatures can climb up drastically. There have been a lot of reported cases of dogs dying because they were left inside a parked car. Always have fresh and clean water for your dog. Make sure your dog has plenty of fresh and clean water available at all times. Dogs can get dehydrated quite quickly especially during the blazing days of summer. Bring water. If you’re going out with your dog, see to it that you bring water for your dog as well. Access to complete shade. If your dog loves staying outdoors or if she’ll be out for any amount of time, she should have access to complete shade. It’s time to go for a shorter do. It’s the rave for dogs during the summer. If your dog is long coated, you can shave it down to an inch length. Don’t go beyond 1 inch as your dog’s fur actually offers protection against the sun. If you’re not sold to the idea of a shorter do for your pooch, bathe your dog regularly and make sure that you brush her coat and groom her regularly. These will help prevent problems that excessive heat brings. Early morning or early evening walks or exercise. Walk or exercise your dog early in the morning and after the sun has already set. These are the coolest parts of the day. If the temperature is at 90 degrees… keep your dog indoors. If it can’t be avoided that your dog goes outside, hose your dog down with cool water. Or maybe play in the sprinkler with her. No overexerting during hot weather. Whatever time of the day it is, even if it’s after dark, do not overdo exercise or play sessions with your pooch. Overexerting your dog in hot weather, is just inviting heat related health illnesses. Don’t let your dog walk on hot pavement. This can burn her paws. Plus the heat from the concrete can also overheat your dog very quickly. Very quickly, if your dog is overheated, she can suffer serious damage to her brain, heart, liver and her nervous system. You should watch out for symptoms of overheating and know what to do to cool her down. Let us first discuss the signs to watch out for. She’s excessively thirsty. So be on the lookout if your dog has been drinking a lot more than the usual. She’s vomiting and has bloody diarrhea. Her tongue and gums are bright or dark red. Her body temperature is at 104 degrees Fahrenheit or higher. She’s weak (Some dogs even can collapse). There is an increase in her pulse and heartbeat. Heatstroke happens when your dog’s body temperature reaches 109 degrees Fahrenheit. What happens to your dog’s body during a heatstroke? It’s ugly. The cells of her body start dying. Her brain swells up which lead to seizures. The GI tract gets ulcers because of the lack of blood supply. Her kidney is damaged because of dehydration and this damage is irreversible. And all of these happen in just a matter of minutes! 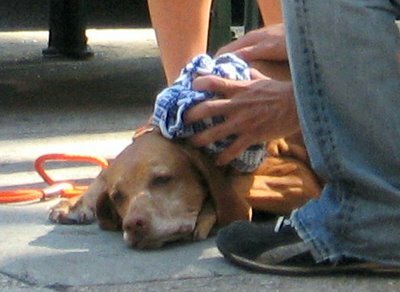 It can be hard to assess your dog’s condition during the early stages of a heat-related illness. It’s normal for dogs to pant when they feel warm or when they are doing activities. It’s best to learn how to take your dog’s temperature using a digital thermometer – and this one has to be done rectally. You can ask your vet to teach you how to do so. Knowing how to take your dog’s temperature can save her life. Watch out for our next post where we’ll discuss what you need to do if your dog is showing signs that she’s overheated. How do you protect your dog from the heat? Let other dog parents know by sharing your tips with us! Or simply share this article on Facebook, Twitter, or email.